Are you the kind of ukulele player that wants to deeply understand their instrument? Have you ever wanted to know the notes of the fretboard and how they interact and relate in meaningful ways to make music? That’s what this lesson’s about. In this two-video lesson, you introduce yourself to the world of major scale theory on ukulele starting with the chromatic scale and major scale. The major scale is the foundation of music you make on ukulele. Learning the major scale is important if you ever want to compose, arrange, or write your own music. The major scale also demonstrates a meaningful relationship between notes on the fretboard. This understanding allows you to become a more creative musician and ukulele player. By the end of this lesson, you’ll know how to make a C major scale and play it in first position. Before you begin, refresh yourself on the notes of the open strings of the ukulele. Tuned in standard tuning, from the top to bottom string, the notes are G-C-E-A. For a refresher on how to read ukulele tab, go here. It’s from these open strings you build your first scale. But first, watch the video and learn what a scale is. A scale is a collection of notes arranged by pitch in order. Different scales have different sounds. For example, the major scale sounds happy, whereas a minor scale sounds sad. In Western music (the music you’re playing on ukulele), there are just twelve notes. If you arrange these twelve notes in various meaningful combinations and orders, you get hundreds of different scale types and scales in different keys. Of the twelve possible notes to create scales, there are seven notes called natural notes. 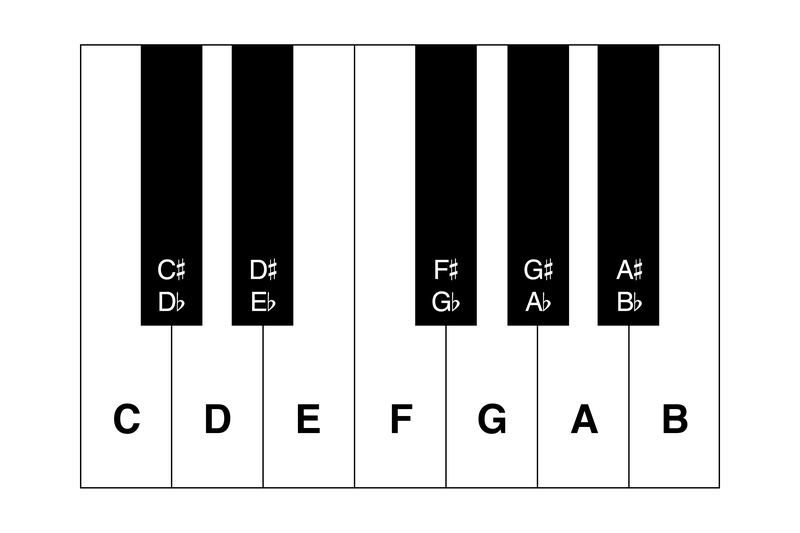 These natural notes are based on the first seven letters of the alphabet: A, B, C, D, E, F, G.
These seven notes are referred to as the basic diatonic pitches (more on that later). Natural notes can be identified on the piano as the white keys. As you go up the alphabet, the notes get higher. 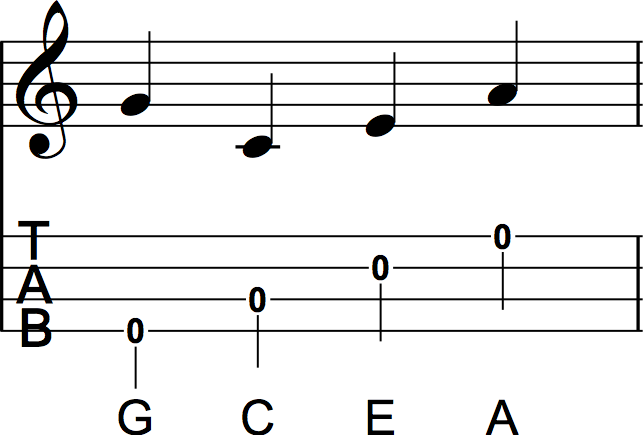 For example, a G note is higher in pitch than an E note. Once you get to the letter “G”, the sequence starts over again. You’ll soon see how this works on the ukulele. An accidental note is a natural note with a sharp (#) or flat (b) symbol. A sharp raises the natural note’s pitch up a half step. 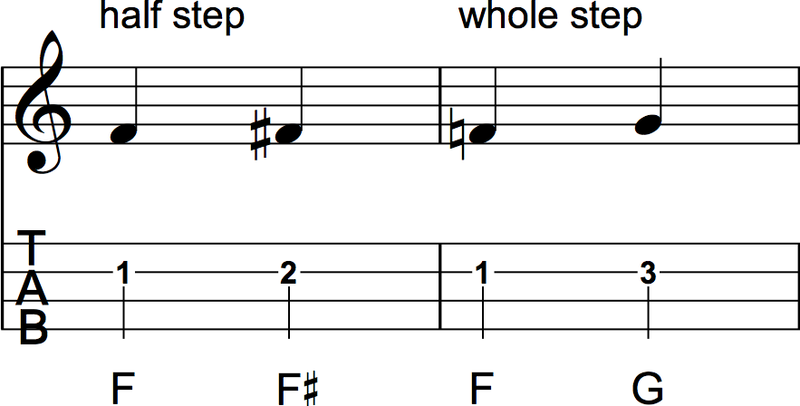 A flat lowers the natural note’s pitch down a half step. The sharps and flats are the black keys on piano. Side Note: You might be wondering why the illustration of a piano. After all, aren’t we learning ukulele? The piano provides a nice visual example of the contrast between white keys (natural notes) and black keys (accidentals). Plus, some of you may have played piano, so for many, this provides a helpful context to understand notes. Notice how sharp and flat notes can share the same pitch, known as an enharmonic equivalent. For example, a C# note sounds the same in pitch as a Db note. In music notation, this would be indicated like so. It’ll begin to make more sense later on when you’ll use sharps or flats. For now, focus on the natural notes. You’ll remember I said there are just twelve possible notes. Let’s play all twelve possible notes on the ukulele by learning the chromatic scale on the open C-string, known as the C chromatic scale. Watch the video above to hear a performance of this scale. The purpose of learning the C chromatic scale is for you to begin to hear how the pitch changes one fret at a time as you go up and down the fretboard on a single string. In the next step, you will take the C chromatic scale and turn it into a C major scale, but before you do that, you must know what a half step interval and whole step interval is. The term interval refers to the space or distance between two notes. A half step interval has the distance of one fret away. A whole step interval has the distance of two frets away. Look at the following figure to see an example of a half step and a whole step. 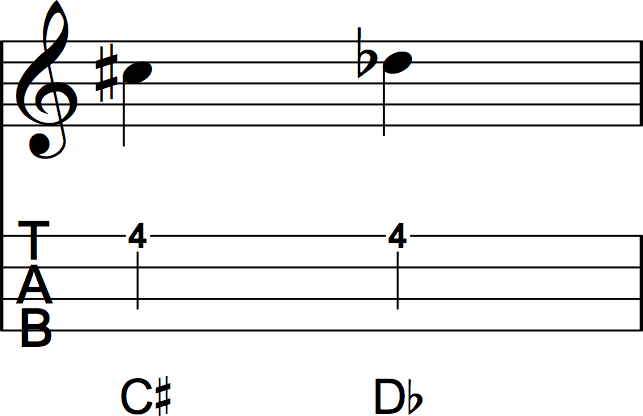 Note: The square-looking marking next to the third note (an F note) is called a “natural” accidental marking, which means to remove the sharps or flats and make the note natural. You take your knowledge of half step and whole step intervals to build a major scale in the next step. Take your knowledge and build a C major scale now. The C major scale is the foundation of all scales you learn on ukulele. In a major scale, there are just seven notes (eight if you include the octave). It’s easy to make a major scale in any key with a simple formula based on whole step and half step intervals. See an example of this in action by making a C major scale starting on the open C-string, which is a C note, known as the root note of the scale. Now that you know the formula and how to make a major scale it’s more efficient to play the C major scale on the bottom three strings of the ukulele. Pay specific attention where the notes are written on the music staff and where those notes are positioned on the fretboard. From your fretting hand, assign the index finger to fret notes that fall on the first fret. Assign the middle finger to fret notes that fall on the second fret. Assign the ring finger to fret notes that fall on the third fret. See this position indicated in the following fretboard diagram. Memorize this position and take it to heart. As you pluck each note of the position, say the note name out loud to put it to memory. By learning the C major scale, you begin learn the natural notes across the fretboard. If you know the natural notes, it’s easy to figure out where the sharps and flats are (we’ll save that for another time! ).